There are plenty of physical parts on a computer that can fail. That’s why you always need a good computer technician to take a look first. We offer excellent Long Island Computer Help & Support, LI Computer Repair Services, Router & Firewall Installations. Are you in need of a computer repair? Did a virus crash your device? Need Computer Help is here for you! Our reliable individual services will give you peace of mind knowing your laptop or desktop is being professionally repaired. We focus on not only fixing your problem, but also preventing it from happening again–And, that saves you money! Our mobile techs are spread out throughout the Houston area so there’s always an expert near you. Don’t let a dangerous virus infect your computer. Let our professional technicians keep your data safe with virus and malware protection software. Have you already lost data from a virus attack? Our malware removal services can usually recover your important documents. Is your computer running slow? If so, it may be time for computer tune-up. Our services will not only clean-up your device but also prevent future problems. If you find yourself in an unfortunate situation where your computer is broken, Need Computer Help is here to save the day! 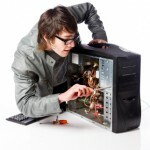 We specialize in fixing broken components on your PC or Apple laptop or desktop. Not having your important data backed up is scary–losing it is even worse. Whether you need virus protection installed, or you need to recover lost data, we have the skilled staff to help. If you’re having trouble keeping up with IT issues in your office, let us manage it for you! Our managed IT services allow you to be hands-off and focus more on growing your business. You can rest assured that our knowledgeable staff will proactively take care of your IT problems. Appropriate firewalls will be recommended, whether your business is a single location small business or a larger business with multiple locations, we know what firewall protocols you will need. Firewalls and networks are maintained with the highest security standards in mind to ensure your business is protected from intrusion or unexpected downtime. Network switches and routers are actively managed by security technicians who are appropriately trained an certified to roll out the correct security implementations. Our extensive experience ensures your business will have a trusted partner and vendor guaranteeing stability and security for your essential business IT systems and network support. We recommend that your business operate solely on commercial grade hardware. Business desktop and laptop computers are utilized and relied upon more heavily than consumer grade equipment. Equipment supplied by Need Computer Help will include a manufacturer warranty and service level agreement. Most equipment includes a 3 year service plan for warranty repairs. Server, firewall, and infrastructure equipment also includes a manufacturer warranty and service level agreement. These steps provide maximum uptime for your business environment. Commercial grade hardware differs in design and construction from typical consumer grade hardware available at common retail stores or common online electronics retailers. Are you ready to take part in your own laptop computer repair? If you follow these hints above you’ll be sure to get off to a great start. Leave it up to Techsonduty! Give us a call at 516-360-0757.